Yentl is a 1983 American romantic musical drama film from United Artists (through MGM), and directed, co-written, co-produced, and starring Barbra Streisand based on the play of the same name by Leah Napolin and Isaac Bashevis Singer, itself based on Singer's short story "Yentl the Yeshiva Boy". The dramatic story incorporates humour and music to relate the story of an Ashkenazi Jewish girl in Poland who decides to dress and live like a man so that she can receive an education in Talmudic Law after her father dies. 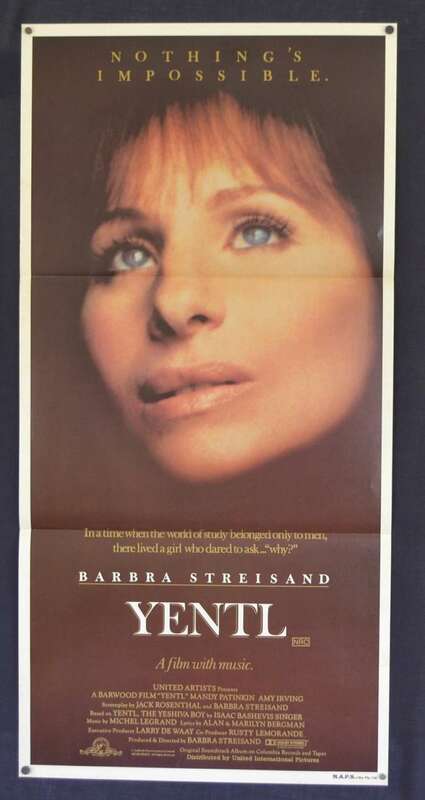 This cultural gender asymmetry that Yentl endures has been referenced in the medical community with the coining of the phrase Yentl Syndrome. The film's musical score and songs, composed by Michel Legrand, include the songs "Papa, Can You Hear Me?" and "The Way He Makes Me Feel", both sung by Streisand. The film received the Academy Award for Best Original Score and the Golden Globe Awards for Best Motion Picture—Musical or Comedy and Best Director for Streisand, making her the first woman to have won Best Director at the Golden Globes. The film was also a financial success.